Installation: Figuring Out the Wires? 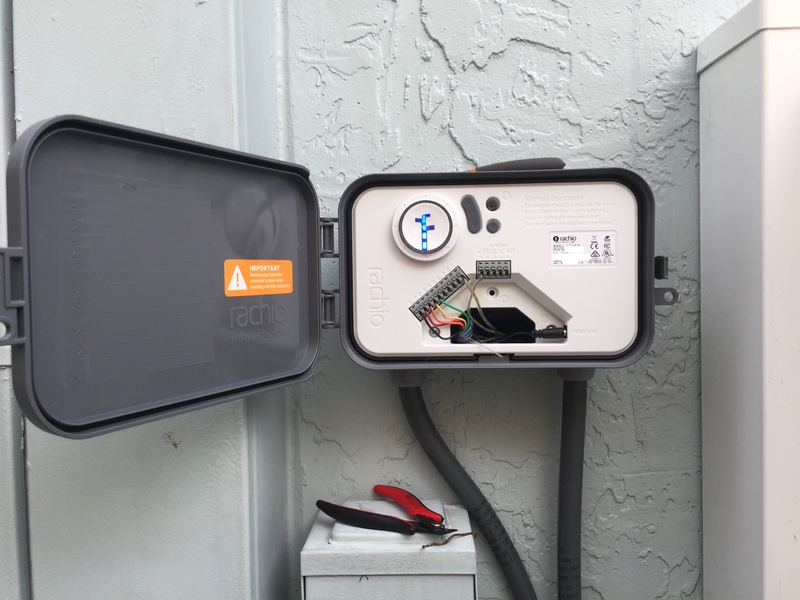 I’ve done one previous Rachio installation, which was fairly simple and turned out great. But, for my second installation, I’m faced with a whole bunch of spliced wires, and am finding it difficult to identify which wire is the common, and whether there is a master valve wire. From the looks of it, you are seeing a standard analog timer, which is controlling one AC (master) water valve, which is in turn connects to an indexing valve. See more about how to set it up with rachio here (link). The only active wires appear to be Red and White, their polarity does not matter (one wire goes to common, the other to master valve port on your Rachio). In order to get a full flexibility of Rachio system, you may need to replace the indexing valve with an independent zone valves (which would require new wiring and plumbing). Thanks very much, Gene. You’re exactly right. We’re changing out the serial valve with individual ones today. Glad to be of service, good luck with the project, been there done that I don’t have photo of my original timer, but it was an interesting 2 day project.